http://rpc.technorati.com/rpc/ping Faiths Faces Kelowna: "Nature's Service on the Penticton Channel"
I didn't attend any service this week as we had plans with some friends and my kids to float down the Penticton river channel. The size of this "congregation" was large, the "service" was nice, and we had some nice "discussion sermons" amongst the friends and family. It was fun, although quite windy at the end (where the current slows noticeably), which was blowing us the opposite way to the current. 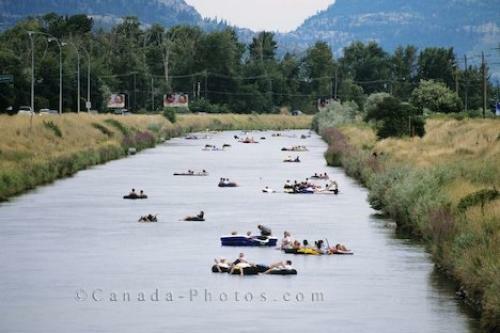 Hence, a lot of swimming was required to get to the Skaha Lake end of the channel. It was fairly warm, but quite smoky, as some forest fires in Washington State were blowing smoke up here.